2PrintBeta solves the problem of cutting multiple cables with an innovative scissors setup. At times, the 3D printing and engineering company 2PrintBeta needs to cut wires and other assorted materials to length. Sure, they could simply cut them by hand, but that takes time and their business is growing. An industrial cable cutter is quite expensive, so being an engineering company, they decided to make their own using a rather rugged pair of scissors actuated by a bolt attached to a drive disk. 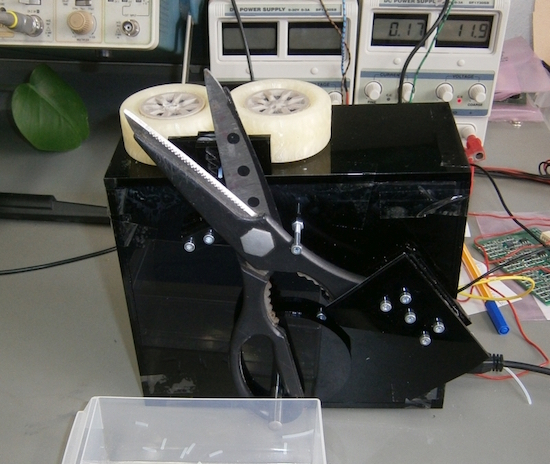 For this operation, wire feeding is done by a pair of 3D-printed wheels, and the “brains of the operation” is provided by an Arduino Mega using stepper motor drivers. If you’re skeptical about how well scissors work in this application, be sure to check out their video below! You can also read more about the project here, or check out Hackaday’s writeup.